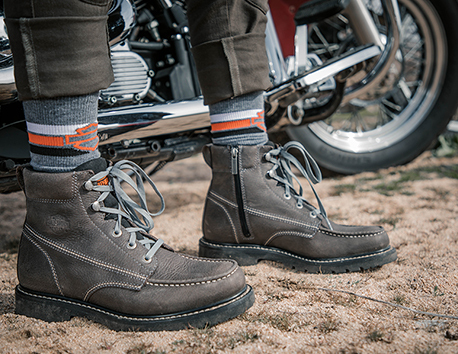 Harley-Davidson Footwear is committed to facilitating the accessibility and usability of its Website, https://www.www.harley-davidsonfootwear.com/ (the “Website”) to ensure that persons with disabilities have full and equal enjoyment of the goods, services, facilities, privileges, advantages, and accommodations of Harley-Davidson through the Website. To accomplish this, Harley-Davidson will be implementing over time the relevant portions of the World Wide Web Consortium’s Web Content Accessibility Guidelines 2.0 Level AA (“WCAG 2.0 AA”) as its web accessibility standard, which will also bring the Website into further conformance with the Section 508 Web Accessibility Standards developed by the United States Access Board. Further, our Website will be tested on a periodic basis with assistive technology such as screen readers and screen magnifiers, and with users with disabilities who use these technologies.